TAMPA, FLA (Sept 19, 2017) A young boy named Alfonso grew up in Ybor City, but he didn’t want to become a cigar factory worker like his father, and at 16 quit his job and left school to play for the local minor league team, the Tampa Smokers. That boy, better known as Al Lopez, went on to become the first Tampa native to play in the MLB, and the second Hispanic to be inducted into the Baseball Hall of Fame. Even during a legendary career as a player and coach, Lopez would return to Tampa where he lived in the same traditional cigar-worker home or “casita” for over 50 years. In 2012, the home was moved from its original location as part of a plan to make room for the I-4 expansion. Thanks to the efforts of former Councilwoman Mary Alvarez and the Ybor City Museum Society, the City of Tampa gifted the property to the Ybor City Museum Society (YCMS) and moved the ‘casita’ to its current location around the corner from the Ybor City State Museum and former bakery Lopez had worked for as a kid. As with any historic rehabilitation, the home was in poorer condition than originally expected, but after more than 4 years of development, the YCMS is hoping to gather the last bit of funding necessary to open the doors to the former home of Lopez and the new Tampa Baseball Museum. As part of a historic streetscape redevelopment along 19th street, the FDOT had relocated four ‘casitas’ and a café in 2001 to a block along Centennial Park. The stretch between Palm Avenue and 8th Avenue welcomes local visitors and tourist alike to explore the Ybor City Museum Sate Park, Hillsborough County Sherriff’s History Center, Ybor City Saturday Market and two HCSO Memorial parks. With the addition of the Tampa Baseball Museum, guests will soon be able to explore Tampa’s 130 year baseball history, from social clubs and cigar factory teams to Major League and everything in between with artifacts selected from a collection of more than 1,500 donations and counting. “The mission of this museum is to preserve and honor Tampa’s unique historic role in the game of baseball and provide community inspiration by celebrating local legends – past, present, and future” says Chantal Hevia of the Ybor Museum Society. The popularity of the sport can be traced back through decades of Little League, American Legions, high school, college and Minor League teams including the Tampa Smokers, a team which has since been moved to Cuba. The museum hopes to share the stories of more than 80 professional players and baseball greats who have called Tampa home, as well as the spring tradition of the New York Yankees and the arrival of the Tampa Bay Rays. 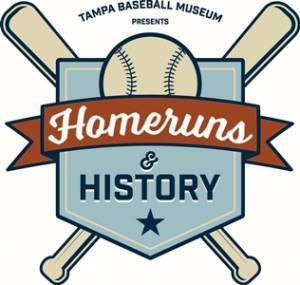 On September 23, the Tampa Baseball Museum, along with the Ybor City Museum Society and the Ybor Saturday Market, will be hosting a free event at the Al Lopez House called Homeruns and History. As an effort to complete the project which was funded largely through grants such as the City of Tampa façade grant, the Hillsborough County History Preservation Grant, foundation and corporate grants, and private donations, the museum will be accepting gifts of any size to complete the exhibits and open the museum. The free family-friendly event from 10 a.m. – 2 p.m. will feature appearances by several MLB players as well as baseball-inspired games, raffles, and more. Several team mascots, including Raymond, will be on hand to greet the crowd. Two special exhibits will be on display. One honors six of Tampa’s iconic players and managers, and the other honors players who have been involved in the renowned Saladino Tournament. Additionally, PNC Bank will present their “Growing Up Great” exhibit with interactivities for young children, Homeruns & History is a YCDC co-sponsored event hosted in partnership with the Ybor City Saturday Market, an open-air market that is located in Centennial Park every Saturday. Attendees can continue their day of baseball celebration by attending a Tampa Bay Rays watch at Coppertail Brewing Co. beginning at7 p.m. and hosted by in-game emcee Bobby Millican and the Rays Street Team. Attendees will have a chance to cement their legacy at the museum by purchasing a few engraved bricks and pavers available in the area outside of the Tampa Baseball Museum. All proceeds from the event will go towards completing and opening the museum. For more information on the Tampa Baseball Museum visit http://tampabaseballmuseum.org/. To get involved, become a sponsor or for volunteer opportunities call 813.247.1434 or email info@tampabaseballmuseum.org.